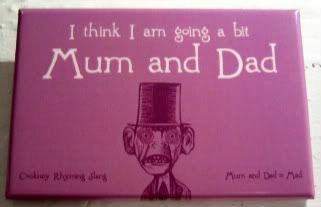 Me friend bought me this supercool magnet down Londontown, and we had a good giggle over Cockney slang, where saying "I think I'm going a bit Mum and Dad" really means, "I'm going a bit mad." But, I'm going to be a bit literal in my usage of this magnet for today, because frankly, I can't Adam and Eve what I just heard not an hour ago, and I know me Mum and Dad would be mad as well. Mad, mad. There we were - the sister in DC, the Save the World sister in Nepal and her fiance - all Skyping away, havin' a giraffe or two, just larkin' about. We spoke for a good long while, because STWsister is leaving at six on Sunday morning to go to South Base Camp. Of Mount Everest. Apparently, a bit of dosh will get you and your sherpa up there, and she has to fly in to the closest airport, and then will do 14 days of walking - just to get to Base Camp. She's not going farther up, but it's something she's always wanted to do - go to Everest. And, that's something I understand. Everyone has things they want to see, do, experience before they die. Of course. And, it's not like thousands of people don't do this exact trek every year. Plus, she's in the neighborhood, so yeah, I totally get it. But how you gonna go visit the highest mountain in the world and not call your parents before you leave? How you gonna go trekking for days and days through some of the toughest climes (and probably climbs) in the world, and send only an email to your parents, leaving your two sisters holding the bag? How? In what world is that ok? She better bring back a damn magnet, that's all I'm sayin'. How come I'm the only one who got the 50-mile radius rule handed down to them in college? It's ok if you go places, that's fine. But, please, if you go outside the 50-mile radius, just call us and let us know. That way, we know where to pick up the body. So tonight, I mentioned that parental law to both my sisters (one's five years younger, the other is eight years younger), and shine a damn light, neither one of them have ever heard that rule!!!! Bah. This weekend, someone's gonna be going a bit Mum and Dad, but me, I'm just thinking about how the life of the oldest of three daughters is so vastly different than the lives of those that come after. I mean, it's close to two decades later, and I'm still quoting the parental rules...but that's what I've heard the Irish say: *A son is a son till he takes him a wife, a daughter is a daughter all of her life. seriously... that's not fair! i've mentioned to them that i had planned to go to everest... but like AGES ago. and now, and i'm SURE its because i didn't tell them again that its happening for reals... i found out that flights to that closest airport have been grounded the past 3 days! grrrr... so HOPEFULLY my flight goes tomorrow. otherwise, i may need a plan b. How am *I* the wildest of the sisters? Inconceivable. Sorry for you, Julie. I hope it works out. ugh... stupid bad weather and wind. no everest for me... but i decided against it anyway because i just won't have enough time to get through everything i want to do here before i leave. and joy's the wildest? jen's the lush? and what am i?? You're the little rolling stone, of course. Our Save the World sister.